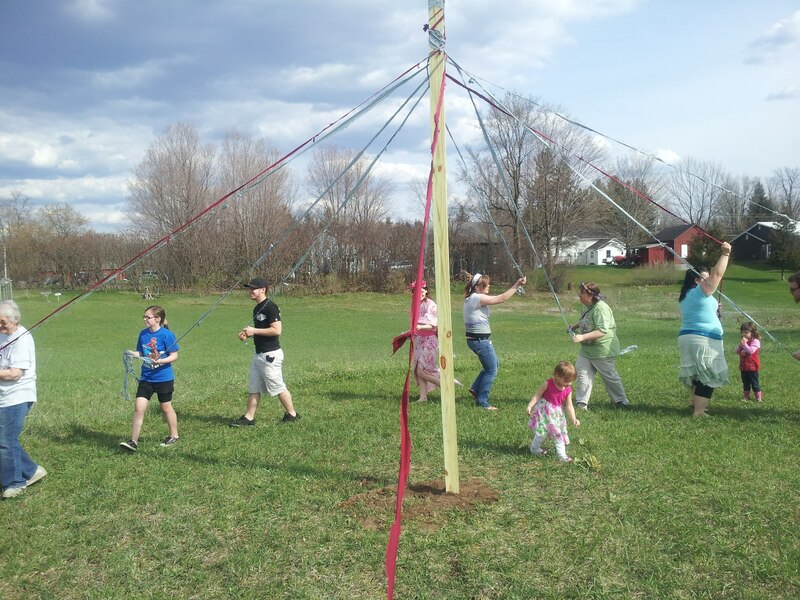 Families always enjoy our annual Maypole dance at Bealtaine. Photo by Heidi, 2013. All minors (anyone under 18 years of age) must be accompanied by an adult. Children who are under 13 years of age must always be supervised by their parent or legal guardian. For example, if your child wants to play outside while everyone is inside doing a workshop or having a potluck, you must accompany your child outside. If your child needs to use the bathroom inside the Yoga Center while everyone is outside, you must accompany your child there and back. This policy will be strictly enforced to ensure the safety of the children and personal property. We strive to have alternative activities for children at our workshops and rituals, but in the event that your child is not interested those, please pack some quiet activities that he or she can do in your presence. Examples include coloring books, puzzles, picture books, dolls, legos, playing cards, and handheld games or tablets with earbuds. Under no circumstances are children to disturb other peoples’ property. This includes, but is not limited to, altars, shrines, ritual supplies, gardens, cars, and Yoga Center equipment. During ritual, children are required to stay with their family. Kids are encouraged to make offerings, but should be guided by parents or guardians so as to not damage or hurt themselves on any of the ritual components, especially the fire. Remind children that this is a sacred space and that we all want to have fun, but it’s a time to be on our best behavior. Before ritual, discuss with your child that there will be quiet times when we are using our imaginations, but that there will also be times for singing, dancing, and clapping. Some rituals even allow for some role play (pretending to be an animal). If you are in doubt, please ask the ritual leader for suggestions about how to include your child. Any behavior that creates a disturbance will not be tolerated (excessive yelling/screaming, running inside, throwing objects inside, roughhousing with other children, general rudeness, and touching other peoples’ property). Children will be warned once. If the behavior does not change, the folk of the grove will ask that the parent takes the child home. This policy will be strictly enforced to ensure the safety of the children and personal property. If children repeatedly create chaotic disturbances, the folk of the grove will ask that parents find a babysitter to care for their children if parents desire to continue attending our events. While we strive to include families in our celebrations, and value that togetherness, in some cases children aren’t ready for ritual. When in doubt, please err on the side of caution. It is better, and possibly safer, for everyone, especially the child. Because Northern Rivers Grove values a connection to natural rhythms and holistic living, we welcome breastfeeding (covered or uncovered). Harassing a nursing mother before, during, or after will not be tolerated. Some events (book chats, workshops on more mature subjects, the Folk of the Grove initiation ritual, etc) will not be appropriate for children due to content or a need for intense focus. Please arrange for a babysitter during such events, unless you are a nursing mother who can easily hold and calm your child, or your child is a genuinely interested teenager. Again, this policy is in place to ensure that everyone can celebrate in peace, joy, and safety. It also enables us to reciprocate the hospitality of our hosts during workshops and rituals. We appreciate your consideration and adherence. This entry was posted in Uncategorized and tagged business, bylaws, families, kids, Kripalu Yoga Center, ritual, workshops by greycatsidhe. Bookmark the permalink.